The great thing about ASP.NET Core is that it’s portable, allowing you to run your Core application on any OWIN-compatible server. So, even if a particular version of .NET Core is not installed on the server, you can still deploy your Core app in “self-contained” mode. In this example, we’re going to use the Orchard Core application. 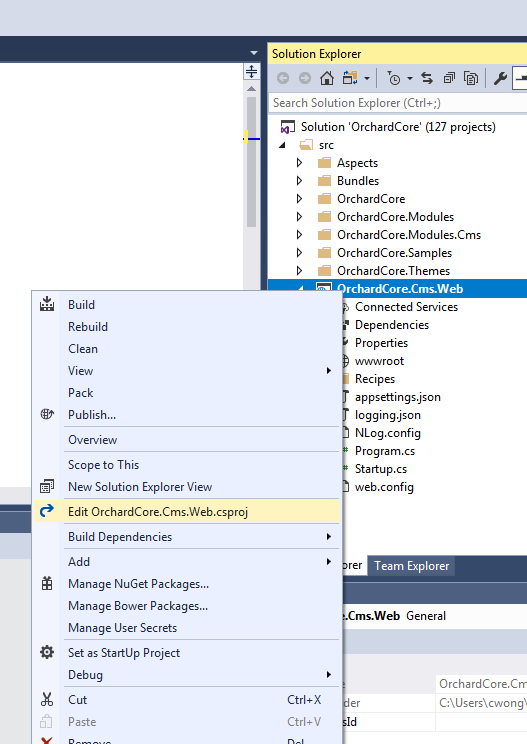 Orchard Core is a re-write of the original Orchard application (the thing that runs all the MSDN blogs) in ASP.NET Core. 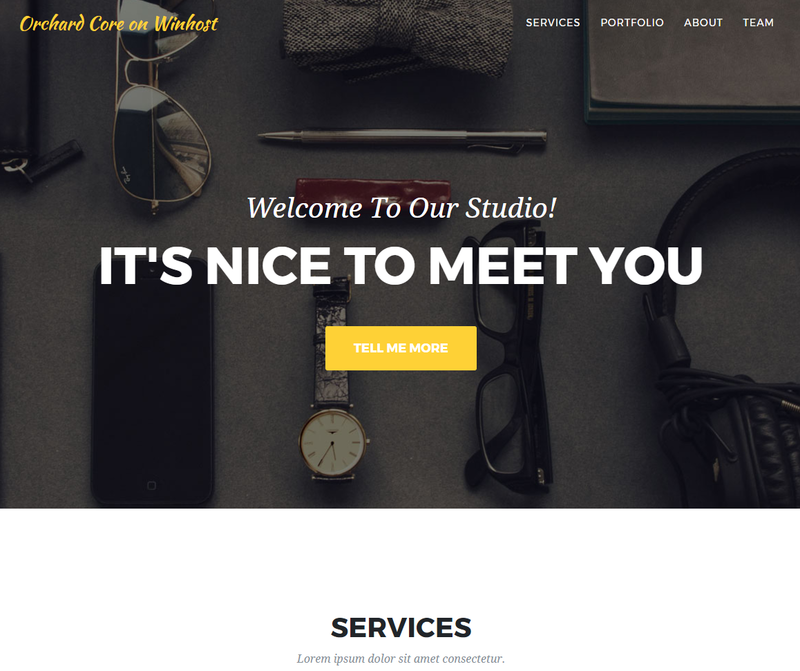 As of the time of this writing, Orchard Core is using ASP.NET Core 2.0. And, at the time of this writing, we have not yet updated our servers with the newest .NET Core to support ASP.NET Core 2.0 natively, but, to repeat: you can still deploy your Core app in “self-contained” mode. First, some house-keeping. 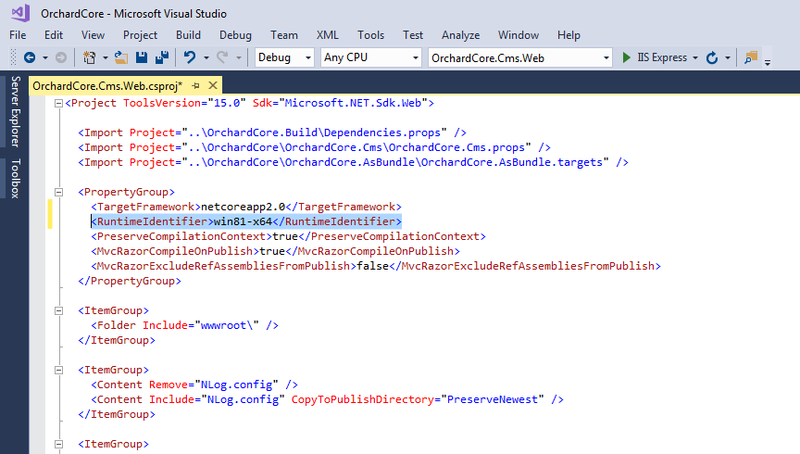 Make sure you have the .NET Core 2.0 SDK installed and Visual Studio is updated. Orchard Core supports different databases, SQL, SQLite, MySQL and Postgres. I’m going to use SQL, which is included with all Winhost plans. 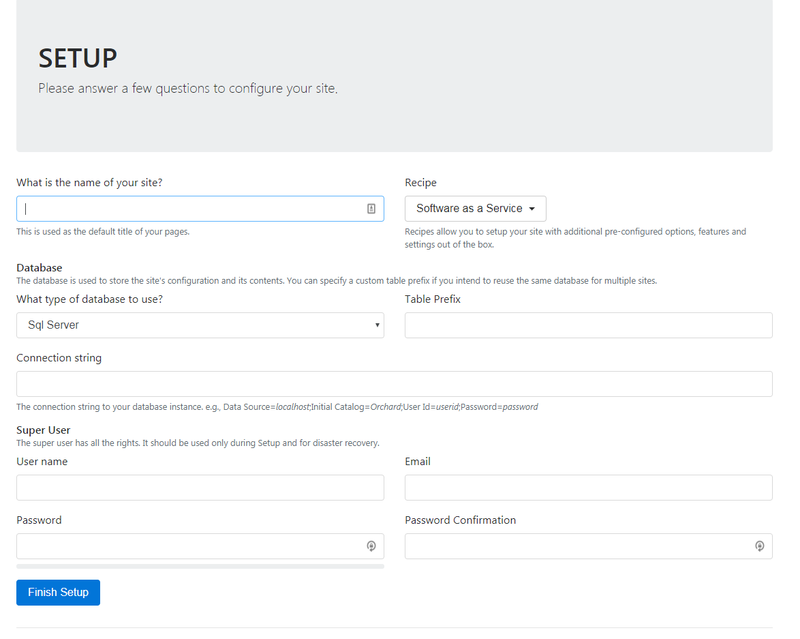 This is a good time to create the SQL database in your Winhost control panel. Download the Master Branch of Orchard Core from GitHub. 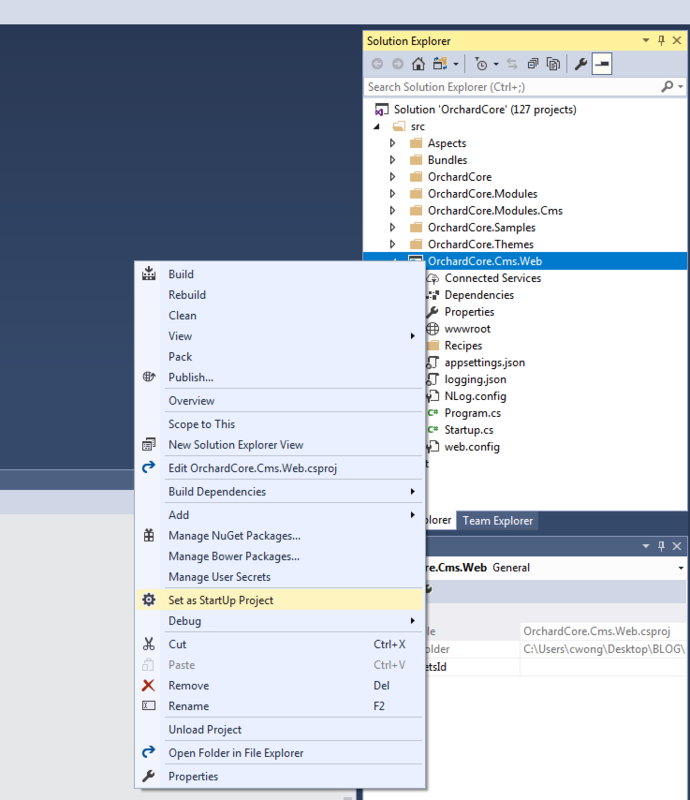 Unzip the file and open the OrchardCore.sln solution file in Visual Studio 2017. Wait for Visual Studio to restore all the Nuget packages. By default, Orchard Core is Framework-dependent. We have to change that to make it self-contained. We have to specify the target platform (tell the application what kind of server it’s going to be running on). In my case, my Winhost site is running on Windows 2012/IIS 8. You can find this information in your Winhost control panel, under the Site Info section. The Runtime Identifier for Windows 2012/IIS 8 is: win8-x64. If you’re site is running on a different server, you can check out the full catalog of Runtime Identifiers here. Before, pre-2.0, we would have run the dotnet restore and dotnet build commands at this point. But now, those are implicit commands with publish. So you can just run the publish command (right-click OrchardCore.Cms.Web and select “Publish…”). I used FTP to publish the project directly onto the Winhost servers. Instructions for different deployment methods are available here. 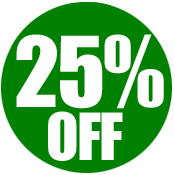 From now through the end of the year, you will receive a 25% discount on all new sites ordered through Control Panel. The discount applies to whichever plan term you select, so the longer the term, the more you’ll save. To get started, go to the “Sites” section of Control Panel and click the “Order New Site” button. Your discount will be automatically applied. If you’ve been putting off purchasing a new site for that special project, now is a great time to get started. This discount is for current Winhost customers only. It’s our way of saying thank you for being a loyal customer. We appreciate your continued support! The discount applies to hosting fees only for the first payment term. Subsequent terms will renew at the regular price. Domain registration and other third party services are not included.